This past weekend, my friends and I celebrated a beautiful bride-to-be Colette, who is also one of the kindest (and most stylish) person you’ll ever meet! To celebrate her upcoming wedding, Erika from Castle Cravings and I threw her a themed Pixie Hollow bridal shower! The first step to planning was picking a Pixie-worthy location. 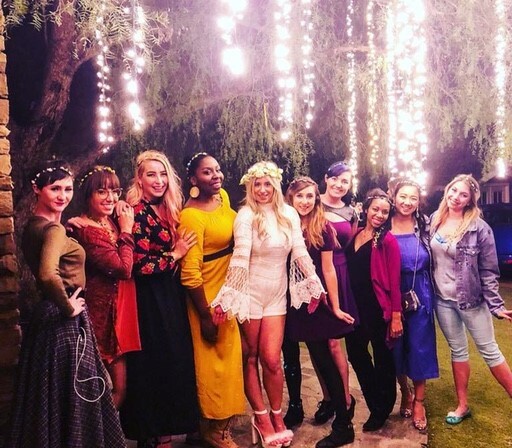 We picked Malibu Wines, since Colette had always wanted to go to Malibu, and Malibu Wines is tucked away in the gorgeous hills, and covered with fairy lights! It’s the perfect location for a chic fairy-themed party. At Malibu Wines, you can bring in your own food and decor, and then purchase wine and wine tastings at the venue. Erika and I put together rustic cheese boards, with a selection of cheeses to satisfy any palette. The boards also included raw honey, strawberries, grapes, crackers, and cashews. For a sweet treat, we had dark chocolate covered pretzels to snack on, and for the centerpiece I made a cheesecake with a cinnamon graham cracker crust. All along the top, I sprinkled gold edible star sprinkles to look like pixie dust. In the center, strawberries to add a pop of color and freshness, and a gold Tinkerbell silhouette from cardstock as the cake topper I found on Amazon. For the party favors, each place setting had a flower crown, along with a sachet of potpourri found from a small fairy-themed shop called Spellbound in Cambria, CA. On the sachet, we tied more of the gold cardstock Tinkerbells. Clipped to each flower crown was a miniature chalkboard sign used as place cards, that had each of the guests’ names on them. For the bride, Erika created a gorgeous flower crown that was white and green, with dashes of sparkle (perfect for Tinkerbell meets bridal)! The bridal shower was perfect for Colette, and we were beyond thrilled that she was happy with what we put together! The best part of the party was definitely getting to enjoy an afternoon with so many wonderful ladies celebrating people we love!